Jesus went up to Jerusalem to observe a feast of the Jews. He was at a pool by the Sheep Gate. The Hebrew name for the pool was Bethesda and there were five porches around the pool. Some writings say that at certain times an angel would come down and stir up the water. 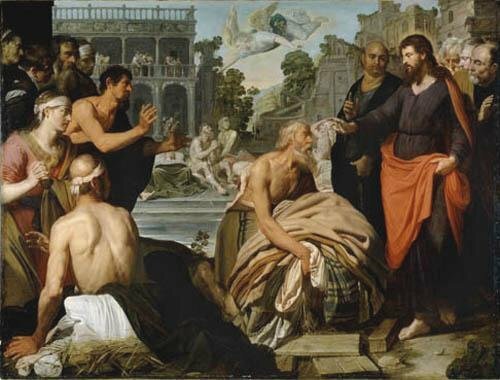 Then the first person to get into the pool after the water was stirred, would be healed of whatever disease or infirmity the person had. So people would wait there by the pool for the stirring of the water. Some were blind, some were lame, and some were paralyzed, not able to move. One of the people at the pool that day was a man who had not been able to walk for thirty-eight years. 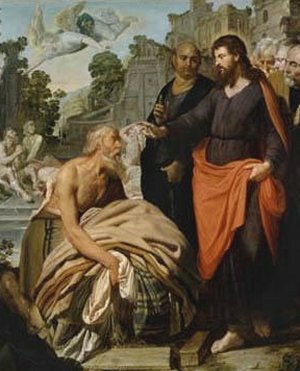 Jesus saw him there and knew of his condition. He asked the man if he wanted to be made well. Of course, the man wanted to be well, but he said that he didn't have anyone to help him into the pool. When the water was stirred, someone would get down into the pool before he had a chance to get there. Jesus told him to get up, take up his bed that he was lying on, and to walk. Immediately the man was made well and did as Jesus commanded him. He picked up his bed and he walked! Jesus walked away into the crowd of people before the man had a chance to even thank him. You would think that everyone would be happy that the man was able to walk after being lame for thirty-eight years. However, there were some Jewish rulers there who saw what had happened, and the only thing they could think about was the fact that he was carrying his bed, and the Jewish law said that you should not be doing any work on the Sabbath day. They didn't care about the man at all! They said, "It's the Sabbath, and it is not lawful for you to carry your bed!" He told them that the man who had healed him told him to carry his bed. The rulers asked him who had healed him, but the man didn't know because Jesus had gone away into the crowd before he could talk to him. Later Jesus saw him in the temple and told him that now he was well and that he should stop sinning or something worse would come upon him. The man went to the Jewish leaders and told them that it was Jesus who had healed him. The leaders were more determined than ever to kill him because he had done this on the Sabbath. Jesus told them, "My Father has been working until now, and I have been working." This really upset the leaders, because not only had he healed the man on the Sabbath, but they said he was making himself equal with God by calling him Father. Jesus healed the man at the pool and he was able to walk again. Doctors and scientists today have learned so much about how God made the body that they can do many wonderful things to help people get well when they are sick. People today are studying the effects of prayer and healing, and many doctors pray for their patients. English Bible Activities Select story #188 in the list for activities to accompany this Bible story. Spanish Bible Activities Select story #188 in the list for activities to accompany this Bible story. What a lovely treatment of this story. This page displayed 152,446 times.